We present a multi-level graph partitioning algorithm using novel local improvement algorithms and global search strategies transferred from multigrid linear solvers. Local improvement algorithms are based on max-flow min-cut computations and more localized FM searches. 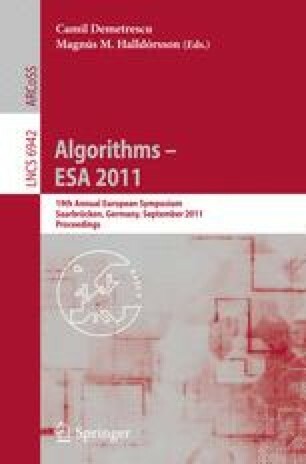 By combining these techniques, we obtain an algorithm that is fast on the one hand and on the other hand is able to improve the best known partitioning results for many inputs. For example, in Walshaw’s well known benchmark tables we achieve 317 improvements for the tables at 1%, 3% and 5% imbalance. Moreover, in 118 out of the 295 remaining cases we have been able to reproduce the best cut in this benchmark. This paper is a short version of the technical report .